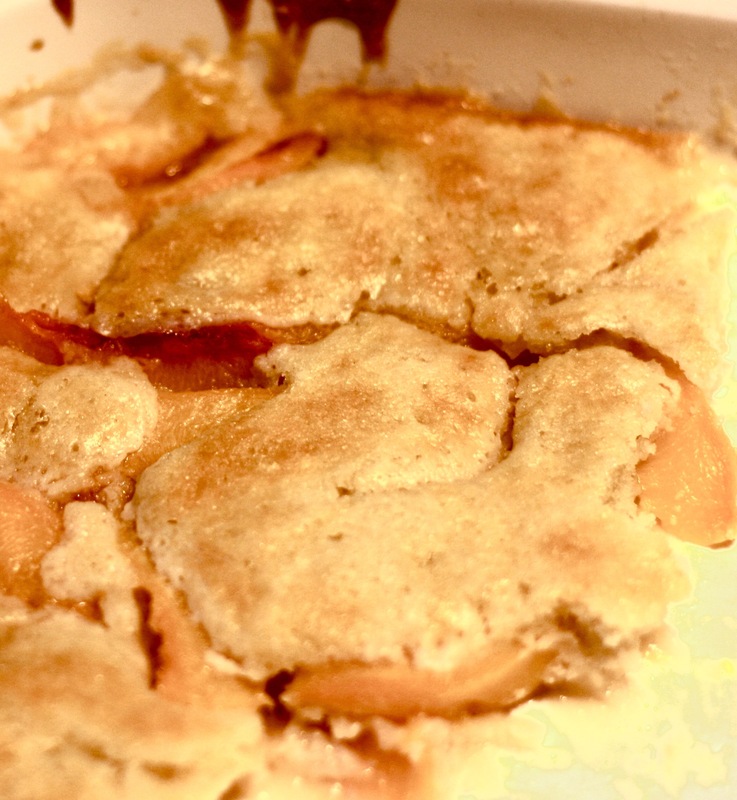 I know it’s hard to be discerning about foods you grew up with, but I’ve always loved my dad’s peach cobbler. I’ve never seen anything like it in recipe books until recently in a Cook’s Country they had a similar cobbler that they described as a “pancake-like” batter from Texas. Well, I don’t know how our family came upon this recipe, because we have no ancestral ties to Texas, but it’s a winner, and it really makes a plethora of peaches much more fun. Another reason to love September. 1. Heat oven to 350. Place butter in a glass 9×13 baking dish, and place in the oven for the butter to melt (this happens quicker if you slice the butter into eight pieces first). Pull the pan out of the oven before the butter has a chance to brown (about 5 minutes). 2. Combine the soda, powder, salt, flour, and sugar in a medium bowl. Then, whisking, add the milk. 3. Once the butter has melted, remove the pan from the oven and pour the peaches over the butter. Then, pour the batter over the peaches. Sprinkle with cinnamon and a pinch of nutmeg, if desired. Place into the preheated oven and bake for 40 minutes. 4. Serve with whipped cream or ice cream hot from the oven. Or cold the next morning for breakfast.